Plant Research and Development (1998), Focus: Forest Management and Sustainability Vol. 47/48, Tübingen, FRG, 184-210. This paper illustrates the forest vegetation of Eastern Tibet presenting a case study from Jiuzhaigou (Tibetan: Zitsa Degu). Furthermore deforestation caused by traditional land use practices and by modern timber extraction is analyzed. Jiuzhaigou Nature Reserve (103°46'-104°05'E / 32°55'-33°20'N) is located in NNW-Sichuan's Min Shan. The high mountain climate (744mm/a, annual mean temperature 7.3°C at 2400m) is subtropically influenced and typical for the moister fringe of the eastern slope of the Plateau. The following altitudinal belts have been classified: 1. The montane mixed forest belt (2000-2700m), differentiated into the lower montane forest belt (2000-2400m), presently dominated by a pine-oak forest, here a hemlock mixed forest has barely survived; and the upper montane forest belt (2400m-2700m), dominated by fir-spruce mixed forests. 2. 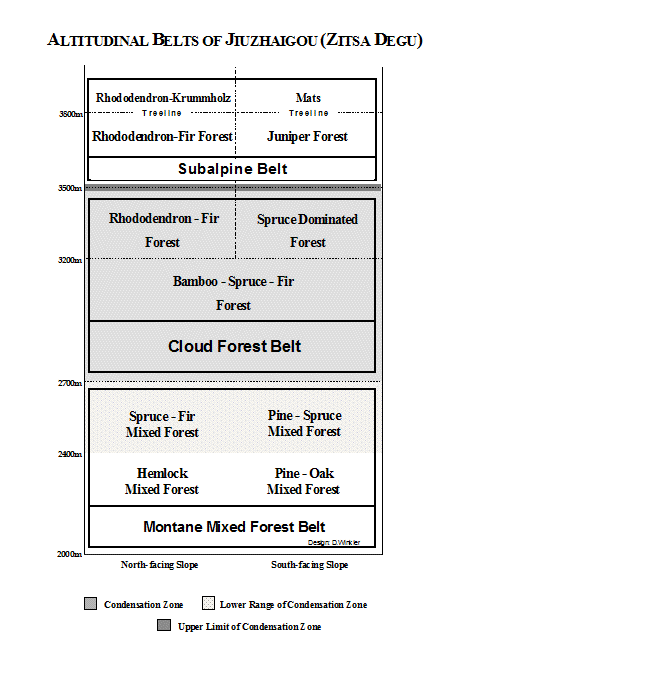 The altomontane cloud forest belt (2700-3500m) consisting of the bamboo cloud forest belt (2700-3200m), dominated by bamboo-fir-spruce forests, and the Rhododendron cloud forest belt (3200m-3500m) with spruce forests on the sunny slopes and fir forests on the shady slope; 3. The subalpine forest belt (3500m-3800m) consisting of fir stands on the shady slope and juniper stands on the sunny slope. Treeline is found at 3800m altitude. The absence of forests on the south-facing slopes was previously attributed primarily to climatic conditions. However, new research has shown that, in Jiuzhaigou, human impact is the primary cause for the absence of forests on the south slopes. Extending over a period of millennia man and his grazing animals caused substantial forest reduction. Thus, one of the main causes of Eastern Tibet's widespread phenomenon of forest-free south-facing slopes is pastoralism. Although commercial timber extraction in Jiuzhaigou was stopped in 1978, the vast forests of the eastern slope of the Tibetan Plateau are being reduced at an alarming rate. Chinese figures point to 50% forest reduction in W-Sichuan in the last 40 years, caused mainly by a state-controlled forest industry. Massive extraction of timber is taking place, neglecting ecological and economical principles. Reforestation and sustainable forest management are still widely absent. In the Southeast of the Tibetan Plateau lies China's forest area richest in timber. At present the region is divided into West Sichuan, Northwest Yunnan, and the Southeast of Tibet Autonomous Region (TAR; Chinese: Xizang), though the Tibetans simply know it by the name Kham. The region is characterized by a very high relief intensity, because of its deeply incised river valleys of Salween, Mekong, Yangtze, Yarlung, and Huang He and the great elevation of its mountain ranges and massifs such as Minyak Gongkar (Gongga Shan, 7590m) and Kawa Karpo (Meili Shan, 6809m). The valley slopes are clad in primeval forests that are unique in their kind and whose existence is at peril through progressive destruction. The species diversity of the southeastern part of the Tibetan Plateau is unique to the Holarctic. Rhododendron alone is represented here by 400 species. Primula, Gentiana, Clematis,Pedicularis, Corydalis, Sedum, Saxifraga, and Senecio each contribute more than 100 species (WANG 1961). More than 50 conifer species are to be found in the region. YANG (1986) has described more than 80 different kinds of forest formation and 250 forest types in West Sichuan alone. The floral richness and multiformity of the vegetation here are favoured by the location, relief, and palaeoecological conditions, which allowed biocoenoses to retreat to lower or more south-facing habitats during glacial periods and "retromigrate" during the interglacials. As a result, the flora of the southeastern slope of the Tibetan Plateau is characterised by numerous tertiary relicts and endemisms (CHEN, 1987). Along the eastern slope of the Tibetan Plateau lie a multitude of climatic zones. The succession of elevation zones reaching from the valley bottoms to the summits is differentiated further by a marked continentality gradient. While the southeastern fringe is influenced by a warm humid climate, the climate becomes colder and drier to the northwest. The diversity of climatic zones is reflected by an incredibly rich biodiversity, especially along the outer fringe. While annual precipitation ranges from ca. 1000 to 1500mm on the intensely furrowed fringe of the Plateau, it is usually around 500 to 800mm for the less broken landscapes of interior East Tibet. This decline in precipitation and relief intensity is associated with a decline in altitudinal differentiation. The elevation zones become narrower and their structure changes as temperate elements take the place of subtropical traits. In general there is a decline in diversity and growth. The vegetation spectrum becomes greatly impoverished with increasing continentality, forest elements giving way to steppe and meadow elements. Thus, the region is endowed with a full-fledged vegetation spectrum ranging from the subtropical evergreen broad-leaved forests in the southeast to the alpine meadow-like steppes of the interior plateau. With growing continentality, treeline rises from 3600m at fringe sites to a maximum of 4,700m (e.g., near Dzogchen, cf. LI B. S., 1993) in the eastern part of the interior Plateau. Jiuzhaigou, whose original Tibetan name is "Zitsa Degu", comprises a catchment area of 650 km2 reaching from 2000m to 4,764m amsl. The valley is drained by the stream Jiuzhai, which runs into the Upper Baishui Jiang (Tibetan: Pä Chu), a tributary of the Bailong Jiang (Tib. : Druk Chu). After becoming a nature reserve in 1978, Jiuzhaigou was accorded the status of World Heritage Site in 1992. It is famous for its '108' picturesque lakes that are dammed up by Sinter dams, the biggest measuring 130m in width and 20m in height. Jiuzhaigou is located in the southern part of the Min Shan Mountains in the middle eastern slope of the Tibetan Plateau. The Y-shaped valley descends from south to north (Fig. 1). It is an intensively folded palaeozooic limestone formation, characterized by great relief variation. Its slopes incline at around 35° and valley bottoms are flat. Originating from successions characteristic of limestone, the soil types of the Jiuzhaigou range from syrosemes (FAO: lithosols) over rendzinas to terrae fuscae (FAO: Chromic cambisols), including various intermediate forms of this succession. Owing to their natural composition and present stages of weathering, most soils offer a good nutrient supply. All horizons under study react in the range between weakly acid (pH 6.8) and weakly alkaline (pH 8.1). Most pH measurements yielded values near neutral. In this essentially subtropical climate, the summer half-year is governed by the southeastern and southwestern monsoons, which contribute at least 75% of total precipitation (see Fig. 2). During the winter half-year a western wind drift prevails. Although they govern the neighboring Gansu, the cold air masses of the Mongolian-Siberian anticyclone do not reach as far south as to the Jiuzhaigou valley. Vegetation and climate maps, however always classify the region as a transition area between the subtropical and temperate zones. At the valley bottom in Nuorilong (2400m), within the fluctuation range of the lower limit of the condensation zone, precipitation is 761 mm/a, whereas on the slopes of the cloud forest (2700-3500m) it reaches at least 1,000mm/a. During the summer monsoon the upper limit of the condensation zone appears to be around 3500m. At this elevation there is a marked decrease in epiphyte growth in forests on shady slopes and a greater frequency of pure juniper stands on sunny slopes, which are known to dominate at precipitation levels of 400-600mm/a. (LI, 1993). This strongly points to reduced water availability as a result of a precipitation decrease and elevated evapotranspiration. It is probably also indicative of the upper limit of the condensation zone. SCHALLER (1993) reports this upper limit to have been at ca. 3200m in Wolong in the January 1983. There is no climate data available from measuring stations at slope or summit sites of the eastern slope of the Plateau. The measuring stations are all located at less humid, extrazonal valley sites, which are often subject to a dry valley climate with local wind systems. LIU (1992) gives the following account of Barkam: "the areas (with an elevation of 3000-3900m) in the main forest belt show a striking increase in rainfall. For example, the rainfall of Kanzhugou (with an elevation of 3100m) [...] is 869.9mm, 2.3 times that of the county seat [Barkam] in the corresponding period." In Jiuzhaigou, too, measurements were carried out at a valley site (Nuorilong), but the measuring stations were no longer in operation in 1991. The Baishui Valley around Nanping (see Fig. 2) is a hot-dry valley, and the lowest part of Jiuzhaigou around Yangdong (2000m) also shows dry-valley features. In the winter half-year it snows. In January and February there is usually a continuous snow cover of 10 to 20 cm around Nuorilong (2400m). Mean annual temperature in Nuorilong is 7.3°C. Mean June temperature is 16.8°C, while that of January is -3.7°C. The study area belongs to the Holarctic floral kingdom, or more precisely to the Sino-Japonic floral region, which borders on the East Tibetan province of the central Asian floral region. LIU Y. et al. (1991) have counted 744 different seed plants, and LIU S. et al. (in LI and PANDAY, 1986) report on more than 150 tree species. Moreover Jiuzhaigou contains a great variety of wildlife. Mammals typical for Eastern Tibet's Palaearctic faunal regions include Black bear (Ursus thibetanus), Goral (Neamorhedus goral) and White-lipped deer (Cervus albirostris). Numerous mammals of Oriental origin, many of them typical for bamboo forests, are present. These include Golden monkey (Pygatrix roxellana), Macaque (Macaca sp. ), Clouded leopard (Neofelis nebulosa), Red panda (Ailurus fulgens), Takin (Budorcas taxicolor), Tufted deer (Elaphodus cephalophus) Forest musk deer (Moschus berezovskii), Serow (Capricornis sumatrensis), Bamboo rat (Rhizomys sinense) and Giant panda (Ailuropoda melanoleuca). The name 'Panda' is apparently of Tibetan origination, meaning 'striped monkey' (see Winkler 1998) . In each altitudinal belt, four 20 x 20m survey areas each exposed to one of the cardinal directions, were selected for representivity and demarcated. The vegetation relevés were surveyed according to the method of the Zürich-Montpellier School, usually excluding fungi, lichen, and mosses. Every vegetation layer was studied on one and the same area, to ensure thorough documentation also in cases of sparse growth. As it was not permitted to take the herbarium out of the country, the author used the ICONOGRAPHIA CORMOPHYTORUM SINICORUM (Beijing, 1973/1987) for identification. A vegetation list for Jiuzhaigou compiled by WU Zhengyi (in WINKLER, 1994) was a valuable help in this work. After completion of the field research, some specimen were identified by botanists of the "Institute of Biology" (CAS) in Chengdu. Furthermore, pedological studies were carried out on the survey areas. Fig. 4: three-dimensional zonation of the forest vegetation. The following presentation gives a description of the vegetation of every altitudinal belt from the valley bottom up to tree line (Fig.3, above). Each is preceded by an account of the typical form of land use, climatic conditions and the prevailing soil types. The forest vegetation is described in its present condition, with particular consideration to tree species. Fig. 4 provides a graphic on the three-dimensional zonation of the forest vegetation. The outline of the herbaceous, shrub and moss layer includes vines and epiphytes. Fig.5 lists the dominating plant species for the vegetation layers in the altitudinal belts. C1: Abies faxoniana^, Juniperus convallium*, Juniperus saltuaria*, Larix potaninii°. Polygonum viviparum^, Fragaria orientalis^, Carex spp., Pedicularis spp., Allium cyaneum, Gentiana sino-ornata. C1: Abies faxoniana, Picea purpurea*, Larix potaninii°. C2: Betula utilis, Sabina spp.*. Smilancia henryi, Salvia omeiana, Polygonum viviparum, Aconitum sinomontanum. E: Usnea longissima. Betula albo-sinensis, Acer caesium ssp.giraldii. C3: Acer davidii, A.fulvescens ssp.pentalobum, Maddenia hypoleuca. S: Fargesia nitida, Helwingia japonica, Sorbus koehneana, Philadelphus incanus, Euonymus spp..
Pseudocystopteris subtriangularis. L: Clemathoclethera actinoides, Actinidia maloides. E: Lobaria spp., Lepisorus eilophyllus, Usnea longissima. C1: Abies ernestii^, Picea wilsonii, Picea asperata, Pinus tabulaeformis*, Pinus armandii. Acer fulvescens ssp.pentalobum, Tilia tuan, Tilia chinensis, Lindera cercidifolia, Litsea sp., Cephalotaxus fortunei^. S: Abelia sp., Dipelta ventricosa, Deutzia longifolia, Viburnum schensianum, Cotonester adpressa, Zanthoxylum simulans. Carex spp.. L: Rubia membranacea. E: Lepisorus spp.^, Drynaria baronii^. C1: Pinus tabulaeformis, Tsuga chinensis'^, Picea wilsonii', Pinus armandii', Koelreuteria paniculata'. C2: Quercus aliena, Quercus baronii, Juniperus formosana, Fraxinus suaveolens*, Acer spp.^. Abelia sp.^. S2: Lespedeza bicolor, Campylotropis macrocarpa, Smilax stans, Daphne giraldii. H: Thalictrum petaloideum, Carex spp., Brachypodium sylvaticum, Melica przewalskii. L: Dioscorea althaeoides, Clematis argentilucida. E: Lepisorus macrosphaerus^, Lepisorus eilophyllus^. The following presentation gives a description of the vegetation of every altitudinal belt from the valley bottom up to tree line (Fig.3). Each is preceded by an account of the typical form of land use, climatic conditions and the prevailing soil types. The forest vegetation is described in its present condition, with particular consideration to tree species. Fig. 4 provides a graphic on the three-dimensional zonation of the forest vegetation. The outline of the herbaceous, shrub and moss layer includes vines and epiphytes. Fig.5 lists the dominating plant species for the vegetation layers in the altitudinal belts. Ecograms on the various forest types (Fig. 6) give an impression of their competing power as a function of water availability (x-axis) and thermal conditions (y-axis). Water availability allows conclusions as to the dominating type of undergrowth. Shady, moist sites are usually poor in shrubs and rich in mosses, while sites with good water availability are rich in shrubs. At exposed sites, grasses and sedges dominate the undergrowth. In CHEN's original ecogram (1987) the lower half of the thermal range is occupied by Sinarundinaria (meaning Fargesia/Sinarundinaria), while the upper half indicates Rhododendron as the predominant species. However, this characterisation is misleading in Jiuzhaigou. The dry-valley character of the study area manifests itself especially in the montane belt by markedly reduced moisture input. Here there is almost no bamboo. Bamboo is replaced by Rhododendron, which is predominant on the shady slopes of the lower montane belt. It is only in the condensation zone that the undergrowth comes to be dominated by bamboo, which requires a minimum mean annual precipitation of 900mm/a in Sichuan (CAMPBELL and QIN, 1983). The altitudinal belts of Jiuzhaigou (Fig. 3) were defined in accordance with MIEHE's (1991) altitudinal zonation of the Central Himalaya. Had it been defined according to the English-language Chinese literature (e.g., YANG, 1992; LI, 1993), the whole altomontane cloud forest belt including the subalpine belt would have had to be classified as "subalpine forest belt". 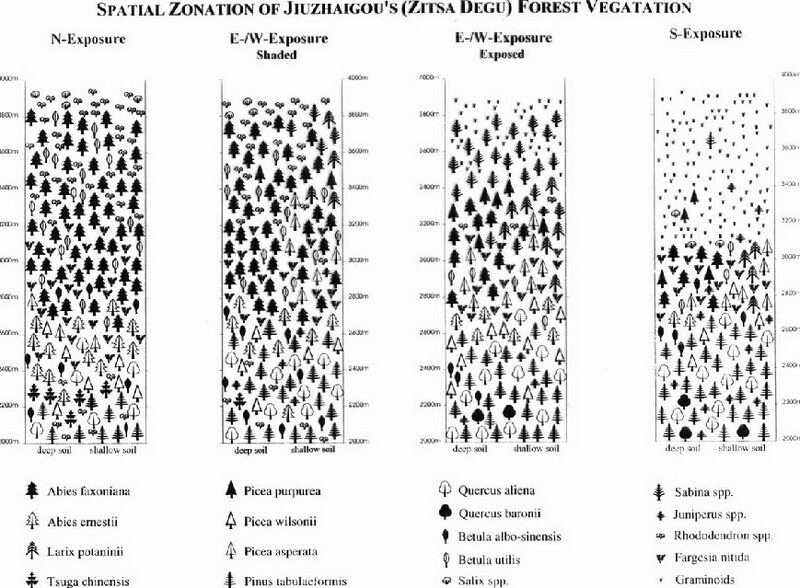 A more detailed description of the forest vegetation and soils of Jiuzhaigou are to be found in WINKLER (1994). Up to an elevation of 2400m the floors of the U-shaped valleys are used for intensive agriculture. In the case of south-facing slopes agriculture is found up to 2600m. This altitudinal belt is most preferred for settlements by the approx. 800 native Tibetans of Jiuzhaigou, who practise the pre-Buddhist Bön religion. They live on animal husbandry (cattle, dris, and yaks) and crop farming. The soil is rich in loess, and mainly used for maize, potato, legume, barley, and wheat growing. (Maize is reported to have been grown already in Yunnan in the late 16th century, where it was introduced from India). Oaks, hornbeams and willows near the villages are utilized as coppice. In the early 1980s, tourism began to change the appearance of the valley bottom. Numerous lodges have been built, for the most part by new settlers, and in 1991 there were 130,000 visitors to Jiuzhaigou, placing an ever-increasing pressure on the local resources. The warmest and least moist altitudinal belt begins at 2000m, reaching up to 2400m on shady slopes and a maximum of 2600m on sunny slopes. The dry-valley character of the climate and vegetation is particularly pronounced at the entry to the valley in Yangdong (2000m), and fades with growing distance from the Baishui Valley. Precipitation (ca. 650mm/a) is less frequent, and temperatures are higher. Large-scale forest fires have repeatedly impaired the forest vegetation on slopes of all aspects. Rendzinas with slowly decaying duff prevail on limestone, and terrae fuscae (Chromic Cambisols) are found on loess loam. Loess occurs frequently at the valley sites of the study area, as it does in many parts of the eastern Plateau (TAFEL, 1914, amongst others). There are only sparse remains of the former species-rich hemlock mixed forest of the shady slopes. Beside the substantial destruction caused by recent fires, the retreat of Tsuga stands to moist, shady slopes is probably due to the dry valley climate. Hemlocks only occur in regions with an annual mean precipitation of at least 700mm/a and annual mean temperatures between 7.1 and 11.1°C (LI, 1993). Presently the lower montane forest belt is almost entirely made up of a comparatively species-poor pine-oak mixed forest, which is usually of secondary nature. In view of the prevailing dry-valley conditions it is probable that this forest type belongs also to the natural vegetation of the lower montane belt. Yet the devastating forest fire in the 1950s, beside other more recent fires, led to its present wide distribution. Large parts of the present secondary pine-oak forest are only ca. 35 years old. The top canopy (C1) is made up entirely of Pinus tabulaeformis. It grows up to a height of 20m with diameters at breast height (dbh) of around 35cm and coverage of 40%. (In the following these data will be given in abbreviated form: "m" shall signify height, "cm" the dbh, and "%" the coverage.) The sub-canopy (C2) is dominated by Quercus aliena interspersed with the sclerophyllous Quercus baronii. (CHEN (1987) quotes Q. liaotungensis in place of Q. aliena and apparently identifies Rhododendron micranthum as Rh. parvifolium). On sunny slopes the tall shrub layer (S1) is dominated byCotinus coggygria with interspersed Lonicera tangutica. Shady slopes are covered more than 50% with sclerophyllous Rhododendron micranthum and in smaller proportion by several Caprifoliaceae and Cotoneaster species. In the small shrub stratum, woody legumes are ubiquitous. The herb layer (30%) is sparsely developed. There are almost no moss and epiphytes in the young secondary forests. From 2400m on shady slopes or 2500m on sunny slopes, up to approx. 2700m, reaches the range of the species-rich spruce-fir mixed forest. This belt has greater moisture input because it is in the fluctuation range of the lower level of the condensation zone. The climate data of Nuorilong (744 mm/a, mean annual temperature 7.3°C at 2400m) is typical of the climate prevailing in the lower part of the belt. The spruce-fir mixed forest roots mainly in rendzinas of different development stages. Owing to the moister climate, lower insolation, and more favorable temperature curves, humification is good; thus the organic horizon is better developed than that of the lower montane forest belt. The upper belt is multi-layered and has a dense crown cover (50m/80cm/80%). It has sustained noticeable damage from human activity: selective cutting on the slopes, which is strongly increasing at present as a result of the lodge building boom; firewood collecting; forest fires, especially on sunny slopes; and forest clearing at valley sites for pastureland in the past. Openings left by selective cutting or windthrow are filled in by pioneering birch (Betula albo-sinensis) and poplar (Populus davidiana). The fir Abies ernestii dominates the deeply developed soils in shady sites, whereas the spruces Picea wilsonii and P. asperata prevail at intermediate sites. Pinus tabulaeformis is competitive at drier and degraded sites on account of its edaphic and exposure preferences. Pinus armandii is admixed in low numbers throughout the belt. The sub-canopy's Quercus aliena (18 m/70cm) often displays broken branches. SCHALLER (1993) reports on the nearby Tangjiahe Reserve "Almost every oak has broken branches, some trees so damaged that only trunk and stump remain". He attributes this exclusively to the Himalayan black bear (Ursus thibetanicus), who will break whole branches while "harvesting" acorns. SCHALLER does not consider epiphyte growth in conjunction with rot and snow cover as a possible cause. The sub-canopy often consists of the red-barked Betula albo-sinensis (15 m/40cm). A third stratum of a variety of small deciduous trees is comprised of maples, lindens, laurels and at very shady sites, the rare Plum yew Cephalotaxus fortunei. These trees are interlocked with numerous Caprifoliaceae shrubs growing up to 5m height. Bamboo is only found rarely in small patches. The herb layer provides coverage of ca. 50%, or up to 75% in light, grassy stands. Mosses only prevail at shady sites, as do epiphytic ferns. Bamboo forest is predominant between 2700m and 3200m and covers ca.15% of the area of Jiuzhaigou. The climate is characterized by very high precipitation (greater 1,000mm/a) and absence of deep winter frost It is equivalent to the extremely foggy lower part of the condensation zone. (SCHALLER, 1985) describes the monsoonal fog in Wolong as follows: "Even when it did not rain, fog continued to swirl along the slopes, everything remained sodden, and everywhere water trickled and dripped. The sun seldom appeared. Humidity remained above 85%, and even on sunny days it seldom dropped as low as 50%". The bamboo cloud forest belt is inhabited by the Giant panda. SCHALLER et al. (1985) reported 40 animals in 1980. Traditionally only the more favorable sites on sunny slopes and in the valley bottom are used as pastures. Many of these are grazed less intensively. In the 1970s large areas of pristine forests were cut clear. As SCHALLER (1993) notes, "Jiuzhaigou was established as a reserve only after it had been logged, after one of China's loveliest places had been degraded." Some of these cuts had been reforested recently with Picea purpurea. The sunny slopes of this belt show traces of repeated forest fire, while the moist shady slopes are not impacted. Intermediate and moist sites are under a fir-spruce mixed forest (35m/60cm for spruce, 80cm for fir/>80%), which grows on humus-rich rendzinas and terrae fuscae. The dominating conifers are Abies faxoniana, Picea asperata, and Picea wilsonii. The latter is particularly competitive in the lower range but gives way to Picea purpurea above 3000m. The sub-canopy consists of Betula utilis and B. albo-sinensis, occasionally interspersed with Acer caesium spp. giraldii (10m/50cm). Forest openings are usually closed quickly by birch stands. The third tree layer (6m/20cm) is dominated by maples and Maddenia hypoleuca. The smaller trees compete with shrubs and in particular with Fargesia nitida bamboo, which covers the entire undergrowth (4m/1cm/60-90%). At shady sites bamboo competes with Helwingia japonica (Cornaceae) which resemble bamboo in having one single shoot axis. Shrubs and small trees are generally greatly inhibited in their development by bamboo growth. Rhododendrons (Rh. prezwalskii, amongst others) are very sparsely distributed, but are found frequently on recently disturbed or sedimented sites, where Rhododendron seeds germinated successfully, but bamboo rhizomes have not yet invaded. An eye-catching sight on forest edges, the Kiwi-related vines Clematoclethera actinoides and Actinidia maloides climb up into the crowns of conifers. The herb layer is well developed wherever the density of the bamboo permits. The moss layer (i.e. Hylocomium splendens, Abietinella abietina, Actinothuidium hookeri) benefits noticeably from the great humidity and low evapotranspiration of the cloud forest belt. Except for exposed sites the branches of the large conifers are clad in thick moss sleeves, which also bear Lobaria lichen and Lepisorus eilophyllus ferns. Usnea longissima beard lichen hang suspended from branches. Broken branches and tops are frequent owing to the weight of the moss sleeves, particularly when these are covered with snow fostering rot. Soils with low water retention favor bamboo dominance, because of its pervasive root system. In such sites, as former scree fields, Fargesia nitida covers over 90% and inhibits regeneration of all other shorter lived vegetation layers, rendering the fir-spruce forest very poor in species. On shady, humid north-facing slopes pure Abies faxoniana stands prevail on humus-rich terrae fuscae soils with Betula utilis in the sub-canopy. Due to the lack of light, this forest type is poorer in species than the fir-spruce forest. The shrub layer is dominated by strong bamboo growth, while the herb layer is mostly made up of Cardamine macrophylla, Chrysosplenium sp. (C. griffithii according to CHEN, 1987), and ferns. The rare Kingdonia uniflora is also present. The hygromorphic character of many herbs here is indicative of the high humidity prevailing in this belt throughout the growing season. The driest bamboo forest type is the larch-spruce mixed forest, which grows in radiation exposed locations on shallow rendzinas. In the lower range Picea wilsonii is competitive, while P. asperata and P. purpurea become more competitive above 3000m, where juniper trees and Larix potaninii start to compete. (Juniperus is differentiated into Sabina and Juniperus in China). The heliophilous larch is a pioneer plant of exposed sites. The all-pervasive presence of dead bamboo lends the forest had an overall gloomy appearance. The naked brown culms remain standing for years as relics of a past bamboo flowering. Flowering of Fargesia nitida is induced synchronously in all conspecifics every 70 to 80 years (SCHALLER, 1985). In the Jiuzhai valley Fargesia nitida last flowered in several stages during the 1970s and 1980s. SCHALLER (1985) and LIU et al. (1991) list Fargesia nitida [(Mitford) Keng] = Sinarundinaria nitida (Mitford) [Nakai] as the only bamboo species of Jiuzhaigou. After flowering, the old stand dies completely. Seeds take several years to germinate and seedlings grow very slowly. (This evidently contributed to decimation of the Panda population in the Min Shan, where 138 Pandas were found perished from hunger. However, the situation was aggravated greatly by habitat destruction and fragmentation, the main challenge to Panda protection). Fargesia fangiana, for example, begins to germinate after three years at the earliest, and the seedlings need another four years to reach a height of 10 - 15 cm (REID et al., 1991). It takes altogether 15 to 20 years for a bamboo stand to reach the height of its parent stand (TAYLOR and QIN, 1992). Seeds only germinate in humid, sufficiently shaded locations. After forest destruction through cutting or burning established bamboo stands are initially favored. Increased light supply and reduced competitive pressure permit the root system to re-sprout immediately and propagate vegetatively. Unless sufficiently shaded, however, Fargesia is unable to regenerate after flowering. Birch is able to regenerate within bamboo stands if sufficiently supplied with light, as after windthrow or selective cutting. Conifers depend on bamboo flowering, or rather die-back for their natural regeneration, because dense bamboo stands greatly inhibit their growth (TAYLOR and QIN, 1989). Around 3200m, many subtropical species reach their maximum altitude and are replaced by temperate elements, due to lack of warmth. The most conspicuous changes are the absence of bamboo and the disappearance of Araliaceae (Acanthopanax giraldii and Panax bipinnatifidus, a Ginseng, amongst others) and climbing Actinidiaceae. The high precipitation of the bamboo cloud forest and relatively low evapotranspiration continues into theRhododendron cloud forest belt. This is evident in strong epiphyte growth, especially on shady slopes up to ca. 3500m. Shady slopes and other sites shielded from solar radiation are covered with snow throughout the winter. Their soils are predominantly shallow terrae fuscae with well-developed organic horizons. The pure Abies faxoniana stands of the bamboo cloud forest extend into the Rhododendron cloud forest belt, now dominating the entire shady slope, albeit with diminished growth (25m/40cm/60%). Their branches are clad in thick moss sleeves. The sub-canopy consists of Betula utilis (10m/35cm/20%), which in some places also occurs, in pure stands. The shrub layer (5m/40%) is completely dominated by rhododendrons (Rhododendron watsonii, Rh.przewalskii, Rh.aganniphum), though Rosa omeiensis, Sorbus koehneana, Lonicera tangutica, and Ribes glaciale are also present. Absence of bamboo provides space for maples. The herbaceous layer, which benefits from the reduced coverage of the above strata, is dominated by sedges (i.e. Carex alpina, per CHEN, 1987), Pedicularis moupinensis, and Rubus pileatus. It overgrows a thin moss layer. On sunny slopes Picea purpurea is very competitive. Its stands are pervaded with junipers (Sabina convallium and S.saltuaria) dominating the sub-canopy. In deep-soiled sites Abies faxoniana is also competitive with Betula utilis admixed in the sub-canopy. In exposed sites, often with unfavorable pedologic conditions, larch (Larix potaninii) is admixed to Picea purpurea. Larch also pioneers in this belt, i.e. after mass movements or fire. Rhododendrons alone dominate the shrub layer, though with diminished coverage and growth (3-4m). At this elevation particularly during growing season there is little fog to attenuate diurnal temperature fluctuations. As a result, the subalpine belt is subject to a markedly worsened climatic water balance. The dominance of juniper forests on the sunny slopes indicates a clear reduction of water supply. Juniper forests typically thrive at an annual precipitation below 600mm (LI, 1993). Restrictions by the Chinese counterpart made it impossible to conduct detailed phyto-sociological and edaphic studies on the subalpine belt. Shady slopes are affected very differently than sunny slopes by the marked temperature drop and reduced incidence of fog. Shady slopes are covered with pure Abies faxoniana stands extending from lower belts and still blended with Betula utilis in the sub-canopy. The growth and coverage (<50%) of these stands are further reduced as they approach treeline. This and the dissipation of maple are favorable to rhododendrons (4m/80%) which make up the entire shrub layer. The herbaceous layer (90%) is dominated by Cardamine macrophylla, Tiarella polyphylla, and Polygonum viviparum. Epiphyte growth is greatly reduced compared with the cloud forest belt. The distribution of firs and junipers on the Yala Pass (3650m) traces small-scale differences in solar radiation exposure. While northeastern slopes bear a dense cover of rhododendrons overtopped by Abies faxoniana, the Rhododendronundergrowth on east-north-eastern slopes is thinner and overtopped by junipers. Above 3500m the sunny slopes of Jiuzhaigou, when still forested, are clad in juniper forest. Exposed sites above the upper limit of the condensation zone are unable to sustain Picea purpurea, Abies faxoniana, Betula utilis, andRhododendron. Here Sabina convallium and Sabina saltuaria (8-12m/40cm/<50%) form light pure stands rising above an undergrowth poor in shrubs and dominated by sedges. Moss and epiphyte growth is also reduced. The juniper forest extends to the treeline, which reaches up to 3800m on sunny slopes. The author was unable to observe pure larch stands in this altitude as described by CHEN (1987), among others. These presumably replace juniper stands after fires. The grasslands above the current treeline is used as pastures for yaks and dris (crossbreeds between yaks and cattle). In some parts the grazing animals have severely degraded the vegetation. This has led to a depression of treeline and Krummholz belt, especially in locations where there is additional tree removal by man. Broad-leaved Rhododendron stands (3m/80%), accompanied by the above-described undergrowth, still persists at shady sites too cold for arboreal vegetation. The Rhododendron Krummholz loses vigor with increasing elevation, giving way to small-leafed Rhododendron (1m/90%) species. The underground is covered with Cassiope abbreviata and intermingling cushion mosses and Lobaria lichen. The Rhododendron Krummholz is admixed with Rosa omeiensis and a blend of Sorbus and Salix species. The latter ones overtop the Rhododendron on east-facing lee sites, where snow accumulates. This vegetation pattern indicates the prevalence of west winds during the winter months. Pioneering after mass movements are willows (Salix spp.). On sunny slopes at around 3800m juniper forests give way to a continuous grass mat of sedges (Carex spp., Kobresia spp.) thinly scattered with solitary Lonicera spp. and Spiraea spp. shrubs. Above 3000m Jiuzhaigou's south-facing slopes are mostly free of forest and often free of shrubs. Numerous authors have reported on the widespread phenomenon in Eastern Tibet of forest-free south-facing slopes next to dense forestland on shady slopes, among them TAFEL (1914), SCHÄFER (1938) (in WISSMANN, 1960), KU and CHEO (1941), and TENG (1947) (see Fig. 1). A detailed study on the phenomenon of forest-free sunny slopes is to be found in WINKLER (1998). Unlike the more continental parts of Eastern Tibet, forest-free slopes in Jiuzhaigou occur only on strictly south facing slopes, rather than on sunny sites in general. This is mostly due to the lesser intensity of pasturing in Jiuzhaigou and partly to the valley's location on the fringe of the Plateau, which is associated with a less continental temperature regime and higher precipitation. To date, the absence of forest on sunny slopes has been almost exclusively been attributed to climatic factors. WISSMANN, summarizing SCHÄFER'S interpretation, writes: "The intensely irradiated south-facing slopes remain almost entirely free of snow during the dry winter. While the grass cover is able to endure high evaporation in conjunction with very large temperature differences, involving thaw during the day and temperatures dropping down to -15°C or -20°C at night, shrubs and trees are not." However, neither the forest-free south-facing slopes of the study area nor the sunny slopes in the more continental parts of Eastern Tibet are entirely free of woody vegetation. Solitary conifers on otherwise forest-free sunny slopes clearly show that tree growth and consequently also forest growth are principally possible here. In Jiuzhaigou, too, there are solitary junipers and spruce trees growing on south facing slopes, which are attesting to former forest growth. Shrubs such as Lonicera hispida, Spiraea mongolica, Berberis dasystachya, and juniper shrubs are also frequent here. On a fully south-facing ridge near the Yala Pass there is a juniper forest at 3650m. The slow-growing junipers are well adapted to the cold and dry climate of sunny slopes and tolerate the extreme diurnal temperature fluctuations occurring there. The phenomenon of forest-free south slopes cannot be explained solely by the extremely reduced water availability compared with shady slopes (KU and CHEO, 1941, amongst others) nor by temperature fluctuations or desiccation (SCHÄFER, quoted in WISSMANN, 1960). The soils of the south exposures studied in Jiuzhaigou are not shallower than those of adjacent shady slopes. In fact excavations have proven the contrary in some cases (WINKLER, 1994). In none of the altitudinal belts studied in Jiuzhaigou were traces found of current solifluidal processes, which could be responsible for the absence of forest growth. The notion that a recent temperature decline could have resulted in a failure of natural forest regeneration several hundred meters of altitude below treeline is equally unlikely. The absence of forest on south-facing slopes above 3000m in the study area is rather the result of repeated fire impact and continuous pasturing. Widespread destructive practices, notably slope burning in conjunction with pasturing have caused the present inhibition of forest regeneration on south slopes. Native Tibetans in Jiuzhaigou have confirmed that south-facing pastures are burnt to keep them free of shrubs. Moreover, forest fires are a frequent occurrence in Eastern Tibet, especially in radiation-exposed locations during the dry sunny winter months (YANG, 1987; CHEN, 1987). Development of winter pastures on sunny slopes plays a key role in livestock husbandry, because it offers a way to overcome the scarcity of fodder at this time of season. Due to the almost vertical insolation here during the winter and the great elevation and subtropical location, these sites are subject to intense solar radiation which normally melts snow covers within only a few days. In Southwest Gansu, which lies immediately north of Jiuzhaigou, TENG observed that forest destruction, whether from wood removal or forest burning, is initially followed by a predominance of shrub associations. "Repeated fires have been responsible for converting the scrub areas into grasslands. This condition has led certain observers to uphold the erroneous view that southern slopes are natural grassland." (1947). TAFEL, in deliberating on the phenomenon of forest-free sunny slopes, came to the conclusion that "The Tibetan nomad, just like any other herdsman, is the sworn enemy of all forest"; "He ruthlessly burns forests to the ground" (1914). The notion that large parts of Eastern Tibet have been deforested through the influence of pastoral cultures finds support in FRENZEL's (1995) palaeoecological studies. Firstly, many steppe soils in Eastern Tibet today are underlaid with forest soils and secondly, pollen diagrams indicate a retreat of tree pollen in favor of grass pollen in absence of climatic conditions to induce such a change in vegetation. In a diagram representing Hongyuan (Tib: Mewa), a region 125 km Southwest of Jiuzhaigou with an altomontane and subalpine vegetation similar to that of Jiuzhaigou, the retreat of tree pollen is seen to have set in some 5100 years ago. The people of this period settled not only in the more fertile valleys such as the Mekong Valley around Chamdo, but extended their activities up into the alpine steppes. 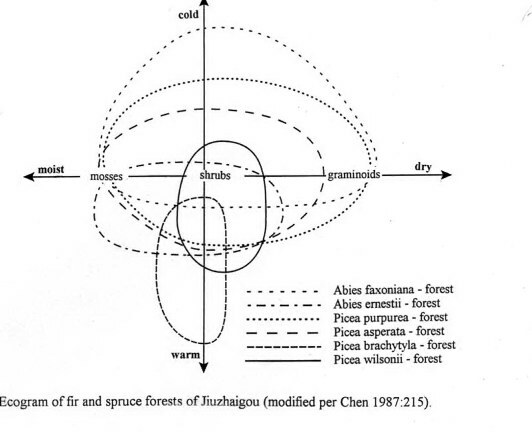 Around 2000 years ago the pollen diagram shows a severe forest decline in Mewa (Hongyuan). In Jiuzhaigou there are clear signs of a succession towards forest regeneration on the studied south-facing slopes in the range between 3000 and 3500m. Furthermore numerous indicators for potential forest growth are to be found, including a juniper stand at 3650m elevation. Some of the more remote grasslands on south-facing slopes have become overgrown with bushes and birch forests during the past decades. This may be due to the availability of new pastures that have developed on clear-cuts carried out on lower slopes during the 1970s. Further contributing factors may be the reduction of animal stock entailed in the establishment of the nature reserve and a presumed prohibition of burning. This process has been distinctly slower on fully south-exposed slopes than on other aspects of sunny slopes. In summary the present absence of forest on south-facing slopes in Jiuzhaigou is clearly the result of anthropo-zoogenic impact in the form of burning and pasturing. Further field studies are needed to determine for sure whether the present climatic and edaphic conditions would allow forest regeneration on the sunny slopes in continental parts of Eastern Tibet in the event that the interference caused by man and pasturing animals were stopped. When studying the forests of the eastern slope of the Tibet Plateau one can hardly overlook the ongoing forest destruction. Although timber extraction in Jiuzhaigou was stopped in 1978 and in some places even reforestation measures were carried out, the destruction of forestland continues unabated in other parts of the region. In earlier times deforestation was a gradual process stretching over centuries and millennia. However, since the onset of timber extraction under Chinese governmental agencies in the late 1950s, the destruction of forestland here has accelerated dramatically. Forestry data on the southeast of the Tibet Autonomous Region (TAR, Chinese: Xizang) is sparse. Furthermore Chinese forest statistics must be treated with caution, as one can infer from numerous Chinese sources (cf. ZHANG, 1988). A western forestry forest expert put it in reference to TAR: "the availability of electronic calculators leads to the appearance of a precision which is an illusion". At present TAR is considered to be the "provinces / regions richest in timber of all of China (2,080 million m3 standing volume, press release of 3.3.94 Xinhua. However, this figure may be distorted by including extensive forest areas of the eastern Himalayan Indian state Arunachal Pradesh, which is claimed by China). In the case of West Sichuan the extent and the conditions accompanying deforestation are well established. According to LI (1993) the forest cover declined from 30% in the 1950s to 14% in the 1980s. YANG (1986) puts the decline in forest cover in the Aba (Ngawa) Tibetan Autonomous Prefecture (TAP, officially "Aba Tibetan and Qiang Autonomous Prefecture"), which includes the study area, at 14%, down from 29.5% in the 1950s. In this period 60% of the standing timber volume has been removed. In Ganzi (Kandze, Garze) TAP the forest cover has been reduced from 19.4% to 10% along the course of the Yarlung (Nyachu). ZHENG (quoted in LI and PANDAY, 1986) gives the following account of the region along the upper course of the Min Jiang: "forest coverage decreased from about 50% in the Yuan Dynasty (more than 600 years ago) to 30% at the founding of New China. And since then it has fallen to 18.8%"; meanwhile 16.1% according to ZHAO (1992). In contrast to some parts of the Himalayas or Yunnan, deforestation in the thinly populated eastern regions of Tibet is not caused by to population pressure, nor to the confusion during the cultural revolution, as ZHENG (in LI and PANDAY, 1986) and LI and ZHANG (in LI and PANDAY, 1986) would have it. SMIL (1984) comes to the conclusion that "What must be termed planned destruction has been one of the leading causes of Sichuan deforestation." Similarly HE (1991) makes the uncontrolled activities of county and state-owned companies and, since economic liberalization, also the greed of individuals responsible for the extensive destruction of forestland. ZHAO (1992) in a study on the crisis of the timber industries in Aba and Ganzi TAP commissioned by the "Policy Research Department of the Sichuan Committee" of the Chinese Communist Party identifies the governmental quota system as the main cause behind the ongoing destruction. The state-owned forestry enterprises, which control most of the timber resources, are obliged to fulfil annual quotas. However, the state buys quota timber at only a third of the free market price, which is below production cost. This means that the state-owned forestry enterprises have to produce a surplus for the free market in order to finance the state quotas imposed on them. Yet the state quotas alone are double or three times the annual increment (SMIL, 1984; ZHENG in LI and PANDAY, 1986). According to a governmental inquiry committee the total annual amount of timber removed in Aba TAP amounts to ca. 980,000m3, i.e., more than four times the ca. 200,000m3 annual increment (EPIGA, 1990). To add to this, the state-owned forestry enterprises are having serious difficulties providing pensions for their retired forest workers, who already outnumber the present active workforce. Protection forests and shelter forest are now being cut to finance pensions (ZHAO, 1992). HE (1991) quotes the state-owned forestry enterprise of Luhuo (Drango, Ganzi TAP) as an example for the mismanagement. The state-owned forest enterprise needs to remove three times the annual natural production rate, to generate the necessary funds for paying salaries and pensions of 2500 active and retired forest workers. Although prescribed by State law, reforestation remains under these circumstances an unaffordable luxury. Moreover, inefficiency and co-ordination difficulties are causing enormous losses in state-owned enterprises. LI (1993) reports of West Sichuan that "on average, logging efficiency is only 40%". Due to the division of work between cutting and transport units cut timber is left back on clear cut areas never to be transported off, a fact also observed by the author. According to ZHAO (1992) 8 of the 11 state-owned enterprises in Aba TAP have already exhausted their resources. Five of them have no more continuous, exploitable forest stands within their district. Until recently, the forests of the state-owned forestry enterprise of Nanping, whose district includes Jiuzhaigou, was only moderately impacted. Now however, it has been required to fulfil 50% of the state quota of Aba TAP (100,000 m3) on its own. Meanwhile, the focus of timber removal has shifted to the more remote Ganzi TAP. Ganzi alone, for example, was required to fulfil 43.3% of Sichuan's total timber quota in 1990. Not surprisingly 5 of the 7 state-owned enterprises in Ganzi TAP have already exhausted their timber resources or will have done so by the end of this millennia (ZHAO, 1992). DONG (in LI and PANDAY, 1986), China's former Vice-Minister for Forestry, conceded that "Administration of forest industry has not conformed to natural and economic principles." Timber production is the most important economic sector for generating a cash income for the region and was one of the driving forces behind road development. Owing to the depletion of its resources, however, production close to the lowlands has sharply declined since the 1980s. Losses have been incurred almost everywhere. Forestry enterprises have been also affected. Numerous sawmills have had to close down. While in 1960 Aba TAD still had to fulfil 84% (2.6 Mm3 of timber) of Sichuan's total state quota of 3 Mm3, its required contribution had dropped to 15% (0.6 Mm3) by 1980. In 1980 the forestry sector accounted for 70.1% of total industrial production and contributed 64% of the total tax revenue. By 1987 its contribution to tax revenue was down to 34% and its share in industrial production dropped to 45%. Meanwhile, economic liberalization has accelerated deforestation at the hands of private enterprises. People have been seen to cut their own trees and sell them on the roadside to truck drivers who transport the logs into the lowland. Although reforestation of the often expansive clear-cuts is still exceptional, there are signs of greater efforts to reforest denuded slopes, especially in forest districts that have already exhausted their resources. LI (1993) puts the total of reforested area at no more than 12.7% of the total felled area. Although some reforestation trials have reached survival rates of 85%, in practice reforestation measures achieve less than 30% (YANG, 1992). Forest regeneration after cutting is difficult. Access is impaired by steep terrain. Furthermore, environmental changes caused by large clear-cuts impede successful regeneration. YANG (1986) reports that temperature extremes increase on clear-cuts. Normal clear days can have diurnal temperature fluctuations of 27.5°C, and on rare occasions even up to 51°C. Consequently, directly sowed seedlings are often impaired by insolation and planted seedlings die of frost. Evaporation on clear-cuts is 3.8 times greater than within comparable forests. Unless clear cuts are soon pastured, which prohibits forest regeneration as well, they rapidly overgrow with bushes, making later reforestation very difficult. Limiting the size of clear cuts would greatly facilitate rapid regeneration (YANG, 1986). Unfortunately forestry expertise is rarely put to use. Although numerous forestry studies have been performed and published (cf. LI, 1990; YANG and ZHANG, 1992 [see LIU X, 1992]; LI, 1993), scientific insight seems to have had very little impact on the economic interests of the state timber industries. DONG (in LI and PANDAY, 1986) confirms that "As a whole there has not been any attempt to manage the forest". It is clear that short-sighted forest destruction could well have been avoided. Yet an ecologically and economically sustainable forest management as demanded by DONG could still change things. As early as 1941 KU and CHEO (1941) concluded in a study that "the forests [...] should be put under scientific management as soon as possible in order to conserve them, utilize them, and develop them properly." At present the greatest hope for East Tibetan forests lies in the influence of the governmental water management agencies. A governmental inquiry commission has designated the ongoing deforestation responsible for drastically reduced flows of the Min Jiang and upper Yangtze in Sichuan between January and May. The resultant scarcity of irrigation water causes crop losses totaling hundreds of millions of dollars a year. Furthermore, according to ZHAO (1992), the frequency of flood disasters has risen from once in 15 to every 5 years. Since the 1980s, Chinese officials have stated a causal relationship between the recent forest destruction along the upper course of the Yangtze and the increasing frequency of flood disasters in Sichuan and other downstream provinces. The construction of the widely criticized gigantic "Three Gorges Dam" (Sanxia) has at least the virtue of bringing the attention of the powerful hydro-electricity community to the condition of Eastern Tibet's forests. One can only hope that HE's alarming prognosis (1991) "If the unrestrained activities [...] continue at this rate, the western Sichuan forest will not last more than 13 years" does not come true. However, China's administration recognizes that mining of the forest resource has to be superseded by truly sustainable forest management practices. "China's Agenda 21", an ambitious nature conservation concept, proclaimed after the Rio Conference bares witness to that recognition. Hopefully sustainable practices will be implemented widely in time to save Eastern Tibet's forests, so that they can continue to function as an important watershed and wildlife habitat, a timber source for China and especially as a multifunctional resource for the indigenous Tibetan population. Prof. TANG Banxing from the Institute of Mountain Disaster and Environment (IMDE) in Chengdu (CAS), offered the opportunity to conduct fieldwork in Jiuzhaigou, where IMDE maintains a research station. The Cooperation, which included a five-week period of field research during the summer of 1991, was initiated by the author for the purpose of writing a diploma thesis, which was eventually submitted, to Prof. Ergenzinger (Geographic Institute, Free University of Berlin). The thesis was written under the tutorship of Prof. Miehe, Marburg and was revised and updated for its publication in 1994. I want to express my gratitude to everyone that helped conducting the research and supported the later publications. Campbell, J.J.N. (1984): Giant Panda conservation and bamboo forest destruction. In: T.N.Veziroglu ed., The Biosphere: Problems and Solutions, Amsterdam, 599-616. Campbell, J.J.N., Qin, Z.S. (1983): Interaction of Pandas, Bamboos and People. In: Jour. Amer. Bamboo Soc. 4, 1-35. Chen, C.G. (1987): Standörtliche, vegetationskundliche und waldbauliche Analyse chinesischer Gebirgsnadelwälder und Anwendung alpiner Gebirgswaldbau-Methoden im chinesischen fichtenreichen Gebirgsnadelwald. Diss. Univ. Bodenkultur Wien 30, 1-316. Dong, Z.Y. (1986): Present situation of forest administration in SW region of China and its role in river basin management. In: Li u. Panday, 53-57. EPIGPA (1990): Environmental Deterioration in NW-Sichuan and the Reversal of Damages by Comprehensive Utilization - Environmental Protection Investigation Group of the Political Association (EPIGPA - Chinese People's Political Consultation Conference) of Sichuan. In: Bull. Soil and Water Conservation 10.1, 20-25 (Chin.). Frenzel, B., Li, J., Liu, S.J. (1995): On the Upper Quaternary paleoecology of Eastern Tibet - Preliminary results of an expedition to the Eastern Tibetan Plateau, 1992. In: Science in China (Ser.B) 38.4, 485-494. He, B.C. (1991): China on the Edge - The Crisis of Ecology and Development, San Francisco. Ku, C.C., Cheo, Y.C. (1941): A Preliminary Survey of the Forests in Western China. In: Sinensia 12, 81-113. Li, B.S. (1993): The Alpine Timberline of Tibet. In: J.Alden, J.L.Mastrantonio, S. Odum (eds): Forest Development in Cold Climates, Plenum Press., NYC., 511-527. Li, C.B. (1990): Ed., Ecological Study of Sichuan Forest 1984-90, Chengdu, 1-586 (Chin., Engl. abstracts). Li, W.H. (1993): Forests of the Himalayan Hengduan Mountains of China and a Strategy for their Sustainable Development, ICIMOD, Kathmandu, 1-175. Li, W.H., Panday, K.K. (1986): Eds., Watershed Management - Proc. Intern. Workshop on Watershed Management in the Hindukush-Himalaya Region, Chengdu, Oct. 1985, ICIMOD and CISNAR/CAS, Kathmandu / Beijing, 1-162. Li, W.H., Zhang, M.T. (1986): Watershed Management in Mountain Region of SW-China. In: Li u. Panday, 3-23. Liu, X.H. (1992): Research into the Dynamics of Soil Ecology of Alpine Dark Coniferous Forests in SW China, p.76-81. In: Yang, Y.P., Zhang, J.L. (eds. ), Protection and Management of Mountain Forests. Proc. 5. Intern. Workshop (IUFRO) in Chengdu - 1990, Science Press, Beijing, 1-269 . Liu, Y.C., Fang, R., Zhou, B. 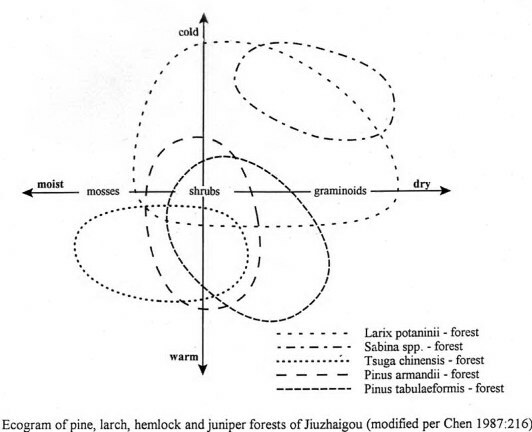 (1991): An Analysis of the Carpophytis Floral Composition in Jiuzhaigou Nature Sanctuary. In: Jour. SW-China Teachers Univ. 16.4, 471-478 (Chin., Engl. abstract). Miehe, G. (1991): Der Himalaya, eine multizonale Gebirgsregion. In:H.Walter u. S.-W.Breckle (eds. ), Ökologie der Erde, , Bd.4, Stuttgart, 181-230. Reid, D., Taylor, A., Hu, J.C., Qin, Z.S. (1991): Spatial patterns and environmental associates of bamboo (Bashania fangiana Yi) after mass-flowering in SW-China. In: Bull. Torrey Bot. Club 118.3, 247-254. Schäfer, E. (1938): Ornithologische Ergebnisse zweier Forschungsreisen nach Tibet. In: Jour. Ornith., Sonderheft, 86. Jg., Berlin, 1-350. Schaller, G.B., Hu J., Pan W., Zhu J. (1985): The Giant Pandas of Wolong, Chicago, 1-298. Schaller, G.B. (1993): The Last Panda, Chicago, 1-299. Sichuan Senlin (1992): Editorial Board of "Forests in Sichuan", China Forestry Publishing House, 1-1535 (in Chin.). Smil, V. (1984): The Bad Earth - Environmental Degradation in China, London, 1-245. Tafel, A. (1914): Meine Tibetreise - Eine Studienreise durch das nordwestliche China und die innere Mongolei in das östliche Tibet, Stuttgart, 1-694. Taylor, A.H., Qin, Z.S. (1989): Structure and Composition of Selectively Cut and Uncut Abies-Tsuga forest in Wolong Natural Reserve and implications for Panda conservation in China. In: Biol. Conservation 47, 83-108. Taylor, A.H., Qin, Z.S. (1992): Tree regeneration after bamboo die-back in Chinese Abies-Betula forests. In: Jour. Vegetation Science 3, 253-260. Teng, S.C. (1947): The forest regions of Kansu and their ecological aspect. In: Bot. Bull. Academia Sinica 1.3, Taipeh, 187-200. Winkler, D. (1994): Die Waldvegetation in der Ostabdachung des Tibetischen Hochlandes - Dreidimensionale Vegetationszonierung mit Bodenuntersuchungen am Beispiel des Jiuzhai-Tals in NNW-Sichuan. Berliner Geogr. Abh. - Beiheft 2, 1-128. Winkler, D. (1996): Forests, Forest Economy and Deforestation in the Tibetan Prefectures of W-Sichuan. In: Commonwealth Forestry Rev. 75.4, 295-301. Winkler, D. (1998): Deforestation in Eastern Tibet: Human Impact - Past and Present: In: G.E.Clarke (ed. ): Development, Society and Environment in Tibet, Proc. 7th Sem. Intern. Assoc. Tibetan Studies (IATS) 1995 - Austria, Vienna, 79-96. Wissmann, H.v. (1960/61): Stufen und Gürtel der Vegetation und des Klimas in Hochasien und seinen Randgebieten. In: Erdkunde 14/15, 249-272/19-44. Yang, Y.P. (1986): Importance of the ecological balance of the subalpine forest of W-Sichuan. In: INTECOL Bull. 13, 41-44. Yang, Y.P. (1987): Alpine forests in Western Sichuan, China and the effects of forest management. In: T.Fujimori u. M.Kimura (eds): Human Impact and Management of Mountain Forests, Proc. Intern. IUFRO Workshop 1987, Ibaraki, Japan, 67-79. Zhang, H.L. (1988): Past, Present and Future Development Tendencies of the Forest Resources in China. In: Journal of Natural Resources 3.3, 201-214 (Chin., Engl. abstract). Zhao, A. (1992): The crisis of the forest industry in the Tibetan areas of Sichuan and ways toward positive development. In: Jinji Dili (Economic Geography) 12.1, Changsha, 55-61 (Chin.). between the Himalayas and the Hengduan Mountains. In: Li u. Panday, 25-38.